Chattanooga’s premier visual arts festival returns to the First Tennessee Pavilion April 21-23, 2017. Named a "Top 50 Fine Arts Fair" by Art Fair SourceBook, the 4 Bridges Arts Festival invites guests to a weekend of exceptional fine art in the heart of Chattanooga&apos;s historic Southside District. Diversity in mediums and styles in a truly unique 50,000 sq. foot pavilion, mixed with serious art buyers from across the region and beyond create an atmosphere unlike any other. 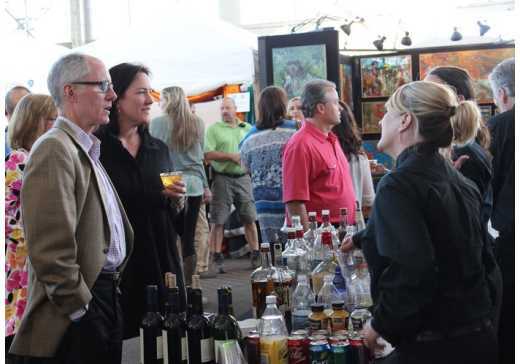 In addition to the fantastic range of fine art, 4 Bridges features art activities for children in the Creative Kids Art Tent, live performances on the music stage, local foodie favorites and a wonderful craft beer and wine selection. It all comes together April 21st - 23rd to create the region&apos;s most prestigious and unique fine arts experience! Featuring work in 2-D and 3-D mixed media, oil and acrylic painting, sculpture, printmaking and drawing, metal, photography, ceramics, watercolor and pastels, wood, furniture, jewelry, glass, fiber and leather and basketry. Time: 6:00 p.m. until 10:00 p.m.
Saturday, April 22nd - 10 a.m. until 6:00 p.m.
Sunday, April 23rd - 10 a.m. until 5:00 p.m. Featuring 156 fine artists from across the U.S., local and regional food , live music performances each day on the music stage, beer and wine sales and kids art activities in the Creative Kids Tent! $15,000 in Cash Prizes will be Awarded by its 2017 Jurors. From left to right: Susannah Darrow - Executive Director of ArtsATL (Atlanta, GA), Andrew Glasgow - Retired Executive Director of the American Craft Council (Asheville, NC), Jeff Morton - Covenant College (Chattanooga, TN).